I find myself putting unnecessary pressure on myself to do this craft or play that game or make this meal and to make sure I am occupying Tristan so that he doesn’t *gasp* watch too much t.v. I am learning that everything can’t be exactly as it was before. Things are different right now – and I am so tired! Before Logan I was doing all of these things with Tristan, but before I had Logan I was also sleeping more than 2 hours in a row! I’ve finally realized that I need to give myself a break, that all I can do right now is my best… and that Tristan watching a little more tv is not going to ruin his smart little mind. This period is temporary… and right now I just need to do whatever it is that is necessary to keep everyone healthy and happy…. and to keep mama from losing her mind! It’s the preschool mornings that are most challenging. 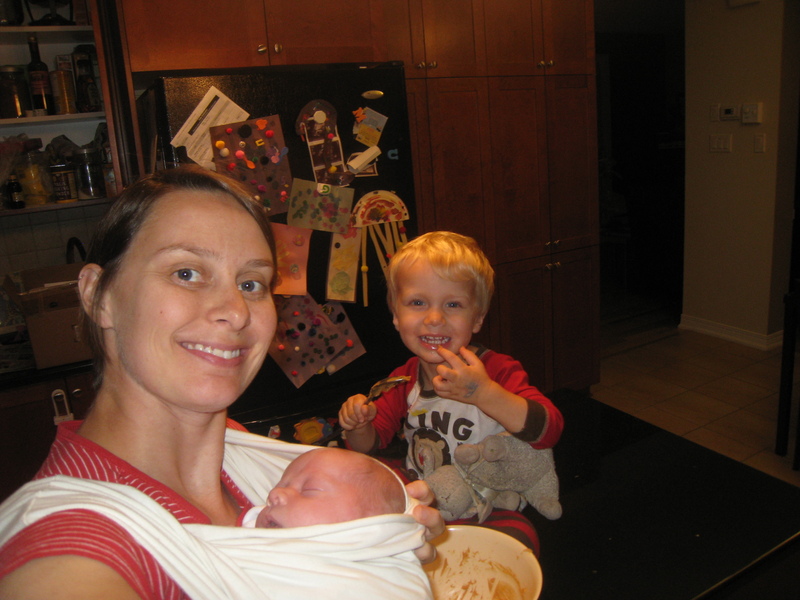 It’s a very busy household with two boys to dress and feed and get out the door by 8:45. Last Friday morning I didn’t get a shower and didn’t eat breakfast. It was noon before I noticed that my was shirt was on inside out. Yep, I am definitely way at the bottom of the totem pole now, just in front of Dante the cat. No, scratch that. Dante was fed breakfast yesterday. We’re still trying to enjoy our days as we did before, doing the things that we love. We’re just not packing as much in and we have more down time. Maybe that’s a good thing. Baking is still on the agenda. Nowadays, the extra weight I am carrying is on the outside, not the inside. 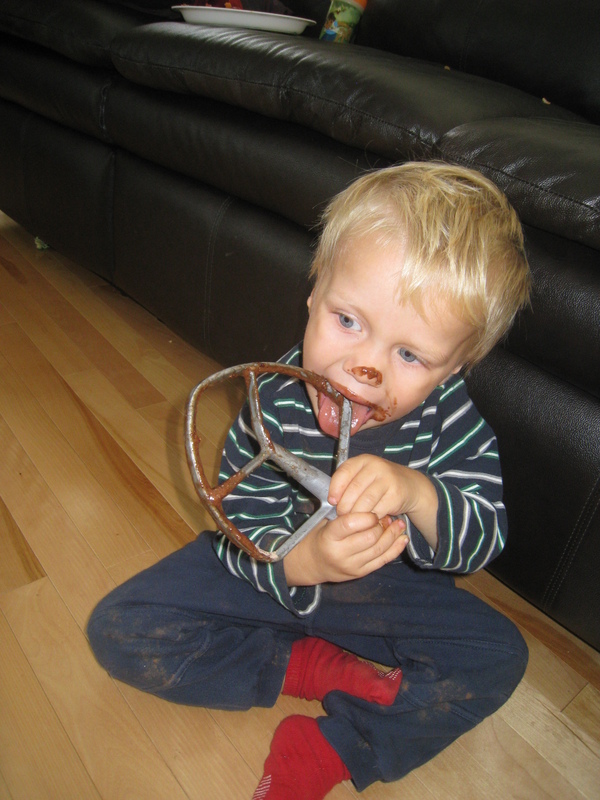 I hope one day Logan will enjoy making cookies as much as Tristan does. It’s comforting to know that some things never change. Free time for myself is rare, and any special moments where I find both boys napping at the same time, I am more likely to join them than to choose some domestic or personal task to occupy my time. Case in point: I began this entry three weeks ago and am only now finally siting down to wrap it up! The sleeping bundle on my lap will turn seven weeks old tomorrow! December has arrived! The month of glimmering Christmas tree lights, cozy evenings of hot chocolate by the fire (who am I kidding? My glass will be filled with red wine!) and letters to Santa. Being old enough to “get it” this year, I wanted to get something to help Tristan count down the days to Christmas. As much as I loved the little cardboard “chocolate-a-day” calendars when I was little, I was looking for something a little more. I was delighted to see this great mitten idea on Kelle Hampton’s blog, and immediately stole the idea for my own use. 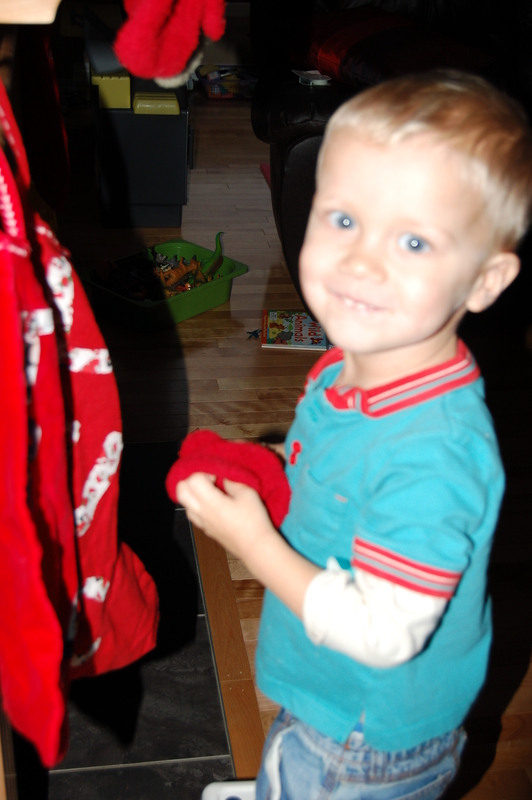 Every day in December there will be something special in a mitten for Tristan. Some days I’ll put a treat, some days a little gift, and other days there will be a note telling him what fun Christmas activity we’ll be doing that day. 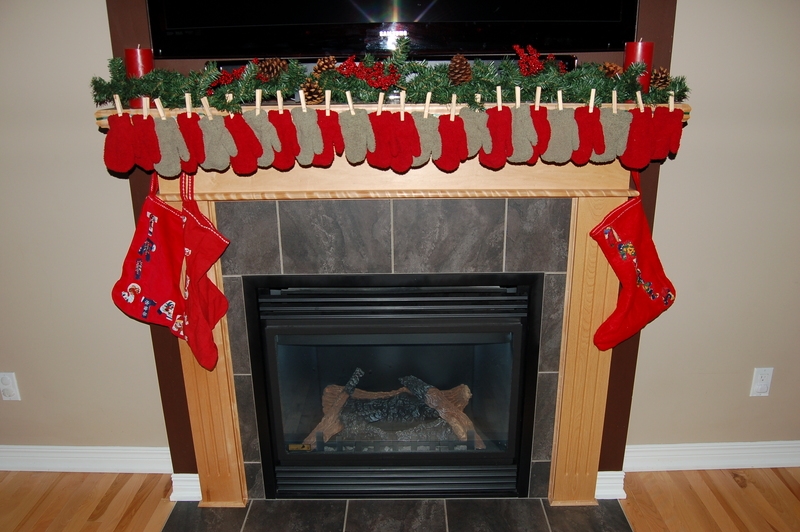 A trip to the dollar store and a whole lot of scotch tape later, and my mitten advent calendar was complete and proudly displayed on our overstuffed mantle. Twenty-four mittens, all in a row. Today being day one of the advent calendar, I anxiously awaited grampa to arrive home with Tristan after preschool, thinking he would be so excited to discover the treasure awaiting him inside the first mitten. I brought him over to the fireplace and explained to him how this fun game would work. 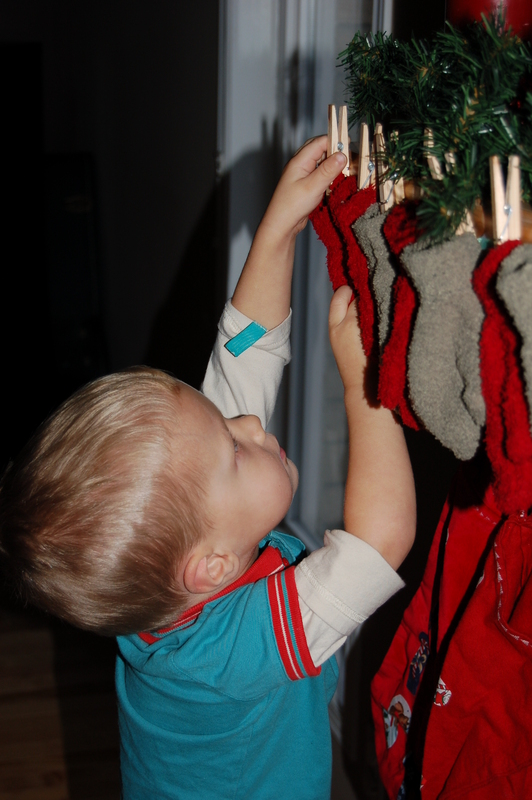 I was astonished when he had absolutely no interest in taking a peek inside that first mitten. My advent calendar dreams were quickly being dashed with each adamant “NO!” every time I tried to entice him. I told him today there was going to be something special to eat inside the mitten thinking that would be the clincher for sure. Ummm, suddenly I understood his hesitation. With that, I pulled the end of the mini smarties box out of the mitten so it was visible and it suddenly became crystal clear to Mr. Hesitation. He immediately ran to get a stool to reach the mitten, grabbed his prize and swallowed the box down in seconds. 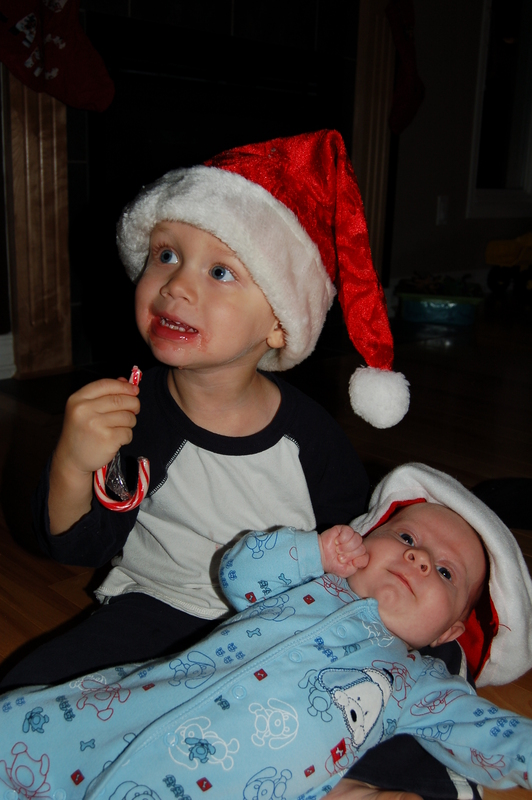 You are currently browsing the A Mom Like Me blog archives for December, 2010.